So, everyone knows that PoppaNut is a HUGE Yankees fan. In fact, we have an entire room in our home dedicated to the Yankees. From autographed balls to pinstriped M&M’s, this room bleeds blue. And PoppaNut couldn’t love it more. Since the Yankees have a huge presence in our lives (during the LONG nine-month season), we certainly go to our share of games. PoppaNut usually wears one of his million NY Yankees shirts with his Yankees flip-flops and Yankees watch. Then, there is me. I don’t have a thing to wear. I have two Yankees shirts, but I don’t really love either of them. So, I went on a hunt. I’m not letting a Yankees game keep my fashion choice down. 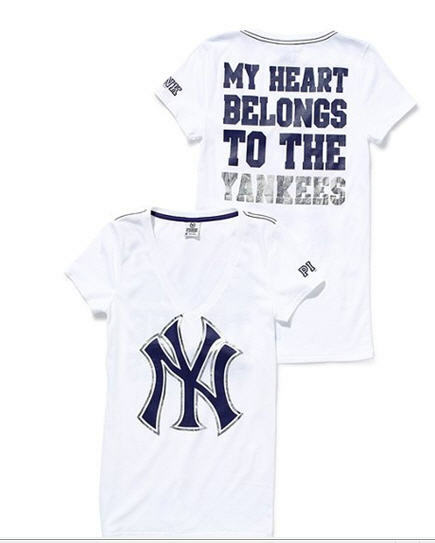 After some lengthy researching, I found that Victoria’s Secret has Yankees shirts. 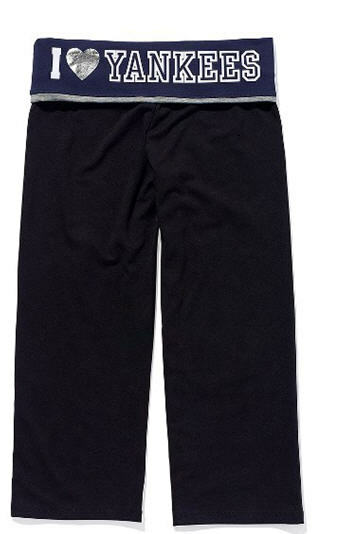 In fact, they have a ton of MLB clothing for us gals as well as college attire! Problem solved. I ordered one Yankees shirt and one IU shirt (I can’t pass up a shirt dedicated to my alma mater, now can I?). I would have loved to order it all … and since we are only half way through the season, it’s likely I’ll make another purchase soon. Which one would you chose? And that’s life in a nutshell … see every opportunity as a chance to make your own fashion statement.